Irish Biltong Company is a high protein gourmet snack, made in Ireland with a 100% Irish beef. It is available online, and in over 500 retail stores in Ireland. Webbuddy has been with Irish Biltong since the beginning. We designed and built their e-commerce website, their retail packaging layouts, exhibition and point-of-sale graphics. 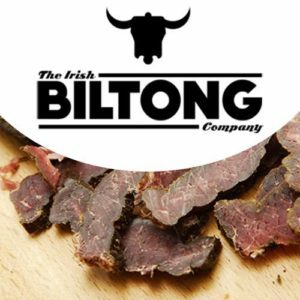 We support Irish Biltong with their online strategy in a variety of ways. Through our ongoing consulting, by collating and managing their web content, and by producing their online video ads with corresponding material. Here in Webbuddy we like to build relationships that last. Having worked with Noreen and John Doyle previously on website development and print design for their successful wholesale premium meat business (Haynestown Meats), we were their first port of call when they conceived The Irish Biltong Company. 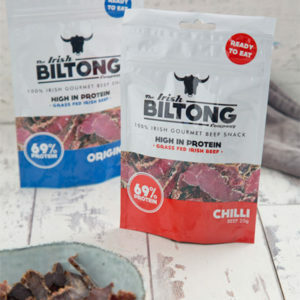 Irish Biltong is a high protein health gourmet snack (100% Irish Beef). Biltong can be eaten on its own, sliced, roughly crumbed or ground-up, used in salads, soups, various beef dishes – and of course sandwiches! Noreen had identified two key markets, health & fitness, and sports as ideal to launch their product into. With branding, packaging, and the website all being designed simultaneously, we were very closely involved and were delighted to see this unique venture and successful strategy take shape. The brief was threefold and focussed on always insuring a consistent look across all aspects of their marketing collateral. To produce the company’s retail packaging layouts and point-of-sale graphic displays. To make video and image ad campaigns to run across the Google network and social media channels. Webbuddy enjoyed working on the project immensely, getting to flex our creative muscles, and working with Noreen and her vision for the brand. We both recognised from the outset the importance of a clear, defined brand, and having an e-commerce website that was easy to use and navigate. So what happened when they launched? Irish Biltong quickly gained traction, exposure and influence on social media. Twitter, in particular, came into its own, with some very high profile rugby players tweeting images of themselves with the product and giving glowing testimonials. It was vital we took advantage of this social media created momentum and Irish Biltong became the Official Biltong Snack Provider to the Connacht Rugby Squad. Mike McCarthy of Leinster (2016), and now David Kilcoyne of Munster (2017), became their Men’s Rugby Sports Ambassadors. Using the stills of Mike McCarthy at the launch, Webbuddy quickly produced a video promo to great effect. We used it as an ad campaign on social media (Facebook, Instagram, LinkedIn, Twitter) and on YouTube. The promo is a great example of how marketing material and images can be turned into an online video ad. At Webbuddy we like to say we are there when you need us, not when we need you. With this in mind, Webbuddy has trained Irish Biltong staff to manage the website content and regularly meets Noreen to discuss the evolution of the website and review the online strategy. We continue to manage the packaging layouts and any other graphic design or print requirements they may have with the web collateral, always keeping with the brand consistency we agreed from the start. The brand is over a year old now, and is proving to be a tremendous success, with product sales online and offline outstripping even optimistic forecasts. It is available in close to 500 retail stores across Ireland already, and they are soon to launch in Belgium, France and Germany. In April 2017 Noreen was on RTE’s Dragon Den, finding herself in the enviable position of having two Dragons offer 100k each for a share in the business. Irish Biltong is becoming more and more popular with consumers simply looking for a healthy gourmet snack. They have started a series of tasty recipes with renowned TV Chef Gary O’Hanlon to showcase the variety of ways it can be incorporated into daily eating habits. The dishes look and taste delicious and are easy to make. Webbuddy created a recipe section in their web blog which enables them to easily share the new recipes each week across their network of customers and social media followers. Our client is extremely happy with the work we have done to date and the ongoing support and commitment to them. Noreen’s testimonial speaks for itself. Our testimonial? 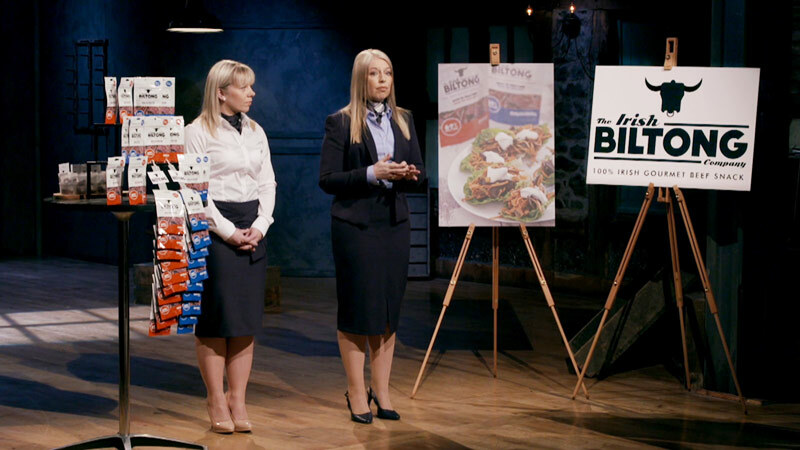 Well….. simple, well done Irish Biltong Company, onwards and upwards, it’s been a pleasure. The Irish Biltong Company and Webbuddy – local partners, succeeding together.